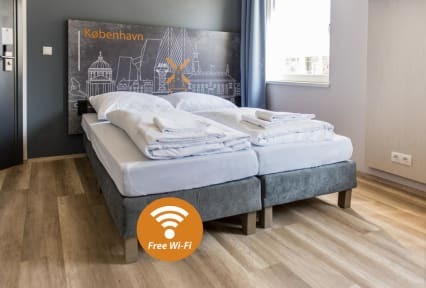 Located next to Copenhagen Bispebjerg Railway Station, a&o Copenhagen Nørrebro offers modern rooms with flat-screen TV, comfortable beds and free Wi-Fi. The hotel includes a stylish bar, guest kitchen and a spacious lobby decorated with high-quality furniture and light décor as well as projectors showing news, hotel services or daily bar specials. A buffet breakfast is available each morning. Packed lunch service is offered. Snacks, pizza, sandwiches and drinks can be bought at the bar or can be enjoyed on-site. Nørrebro is a great choice for travellers interested in cycling, old town exploring and walking. Copenhagen Central Station is 20 minutes’ drive by bus from the hotel. Guests can go relax in the nearby Mimersparken and go shopping in Nørrebro Bycenter. The hotel is 2.9 km from Parken Stadium. Guests can hire city bikes to explore the surroundings. 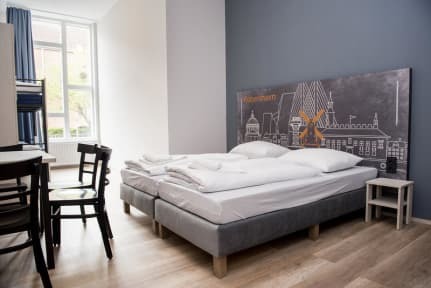 All rooms at a&o Copenhagen Nørrebro feature wooden furniture and floors with traditional Danish art. They also come with a private bathroom with shower, 2in1 shower gel, face tissues and a hair-dryer. Free high-speed Wi-Fi internet is included in all rooms and throughout the property. Hotel rooms such as single, double and family room include fresh linen and towels. Dorm facilities consist of various hostel categories accommodating 4 to 6 people in a room. Linen and towels can be booked extra.